The bohemian and hippy design of Peace, Love & Juicy Couture (A$99/50ml, A$145/100ml) says it all! Peace, Love & Juicy Couture is housed in a bulky heavy glass flacon with a cute turquoise beaded bracelet (with 3 pink tassels, a gold 'J' and silver heart with a peace sign pendent) embracing the neck of the flacon. The bracelet is just gorgeous and I guess most people would instantly recognise the origin of this fashion accessory once they lay eyes on it! Peace, Love & Juicy Couture is quite a youthful scent with top notes of Hyacinth, Amalfi Lemon, Cassis and Red Apple, middle notes of Jasmine, Honeysuckle, Lime Blossom, Magnolia and Red Poppy, and base notes of Patchouli, Orris Root and Musk. The scent of Hyacinth and Cassis are quite dominant with subtle hints of musk. I found that the floral, green and earthy composition of this scent is a tad too strong for my weak olfactory senses. Despite this, the lasting power and sillage are quite average as the scent does dissipate a short while after spritzing once or twice onto my neck. To me, Peace, Love & Juicy Couture is an acquired scent as the initial aroma after spritzing does jump off as being quite strong, but then after reaching out for this scent a few times down the track I've developed a liking for this unique earthy scent! 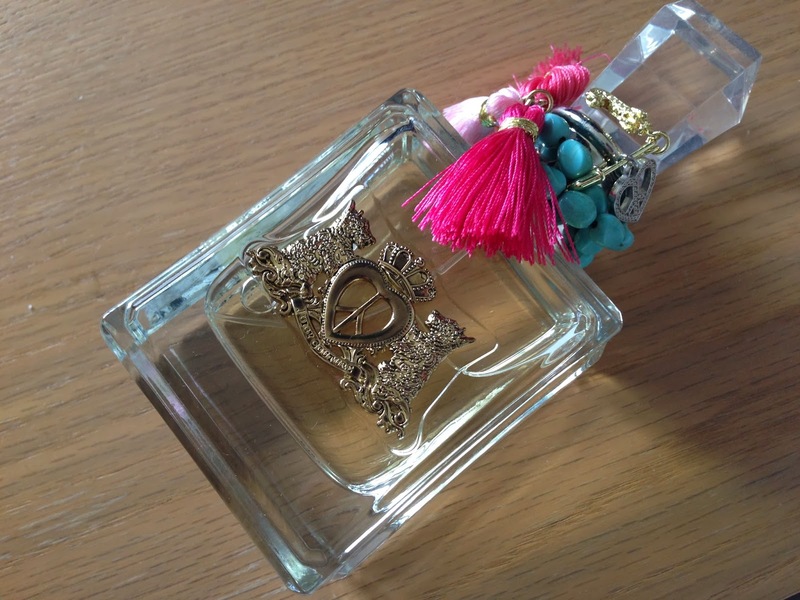 Do you love Juicy Couture fragrances? I love Juicy Couture fragrances! Juicy Couture fragrances are quite unique! NEW Beyoncé RISE EDP fragrance + GIVEAWAY!